I got Rosa her first Radley's and it was while being a lone wolf after my team dissolved while I was defending a flank by myself. I feel bad for letting my team down because I actually almost pulled off a miracle victory but then lost at the last second when their last tank (an arty) got Rosa before she could reload but I really did the best I could considering the map, they had a Bert that was trying to kill me the entire match, and that I was carrying the team for the entire match. On a related note, Rosa broke her distance record with 4.06K total traveled in this match. If you are wondering about the damage, Rosa was top tier and there were a lot of 5-6 tier tanks. Congratulations! 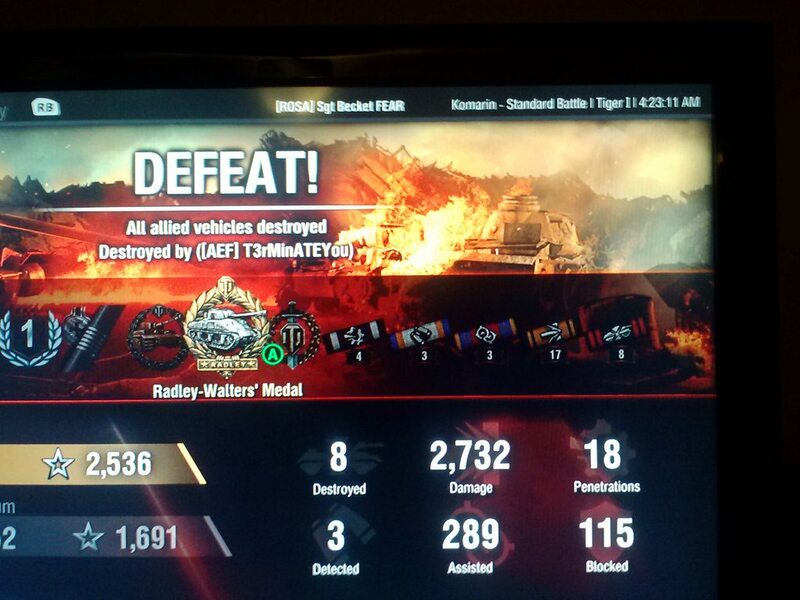 My last Radley Walter's medal was in a Tiger too...Such an amazing tank. I got Rosa her first Radley's. ^Only the first? I'm surprised! Congrats! And considering that game was on Komarin, I'd say it was a top-notch game as well. I hate that map with a passion. Take one of these green arrow thingies. Besides, I honestly don't care much for kills as much as I do direct/assist damage. I don't neglect an opportunity to take an enemy tank out but I also have to remember that my team is counting on Rosa's formidable damage dealing prowess so I often whittle an enemy tank down to almost being dead and then let my teammates have it while I focus on the next enemy tank. In this case, I was facing tanks by myself so it was survival at that point. Nice Game! Got to love the Tiger!